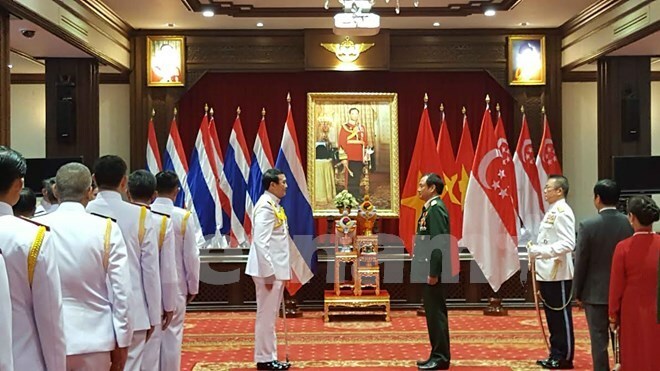 Bangkok (VNA) - Thailand presented Phuong Minh Hoa, vice director of the Department of Politics under Vietnam’s Defence Ministry, with the Knight Grand Cross (First Class) of the Most Noble Order of the Crown of Thailand in Bangkok on May 16. The honour was bestowed on the Vietnamese senior lieutenant general for his contributions to the friendship between the armies of Vietnam and Thailand. The recipient expressed his gratitude to Thai King Bhumibol Adulyadej and for the warm reception he received in Thailand. Hoa said he believed the Vietnam-Thailand strategic partnership would grow. Phuong Minh Hoa is the third Vietnamese granted the honour.